We're back!! Fresh from a wonderful two weeks away in Portugal enjoying some much needed family time with lots of sunshine, blue skies and mini adventures, we're back counting down the final weeks of the summer holidays. They seem to have flown by in the blink of an eye and although my boys going back to school means I can more easily get through day to day chores, I'm actually a little sad. I'm going to miss my mini adventurers! We got back from Portugal to find a new crop of strawberries, ripening blueberries, a fair few white raspberries, beautiful crisp apples just ripe for the picking and plum and damson trees over-laden and weighed down by their bounty. We gathered a LOT of plums in a desperate bid to stop the birds eating them all and now I think we'll be eating plums for a week at least! I've never thought of myself as a plum kind of a person (peaches are my summer go-to fruit) but these ones were particularly sweet and juicy and rather perfect. And there's nothing quite like collecting your own fruit from trees and plants in the garden and eating them fresh with fingers and lips stained from the juice of your treasure. It felt right that I start by making some kind of pie or tart with this beautiful crop and I wanted to pair them with a delicious frangipane and sweet shortcrust pastry. It's quite simple to pull together all these elements and I think the time investment in making your own pastry here is well worth that extra effort. I like a thick crunchy base and this pastry is just perfect for taking on the shape of its scallop-edged baking tin and you also don't need to trim the edges of the pastry after baking as they retain their shape. I do paint the pastry with a layer of apricot jam before adding the frangipane, just so no moisture sneaks through. If you don't want to make the pastry yourself, you can buy it in, but I do recommend having a go at making it yourself as it's not too challenging and is really rewarding when you bite into that crunchy base and know that you've made it from scratch. You can use a round baking tin but I wanted to christen my rectangular one and I kind of like this shape. I adore almonds and frangipane is the perfect filling for almond-lovers. And the smell of it baking is just heavenly :) The plums should be soft and juicy and the perfect accompaniment for the frangipane. 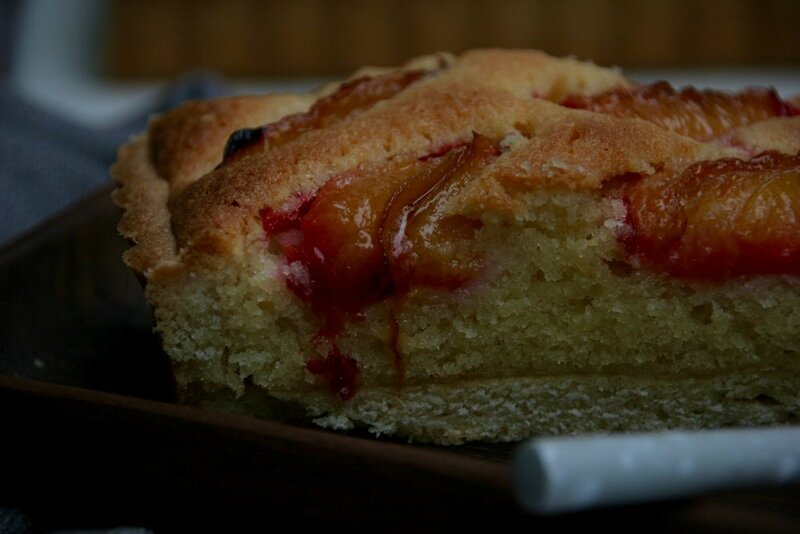 When baked, you should have the texture of cake with the crunch of a biscuit base and the sweetness of the plums giving up their lovely juices. My boys just love everything with custard at the moment so we had to cover it with a vanilla blanket which is a lovely addition. This is a total treat and the perfect way to celebrate our beautiful plums. With the extra plums we had left, I roasted them with vanilla, star anise and cinnamon (in the process I've my deep dislike for star anise!!) and had them piled over meringues which was so delicious too. 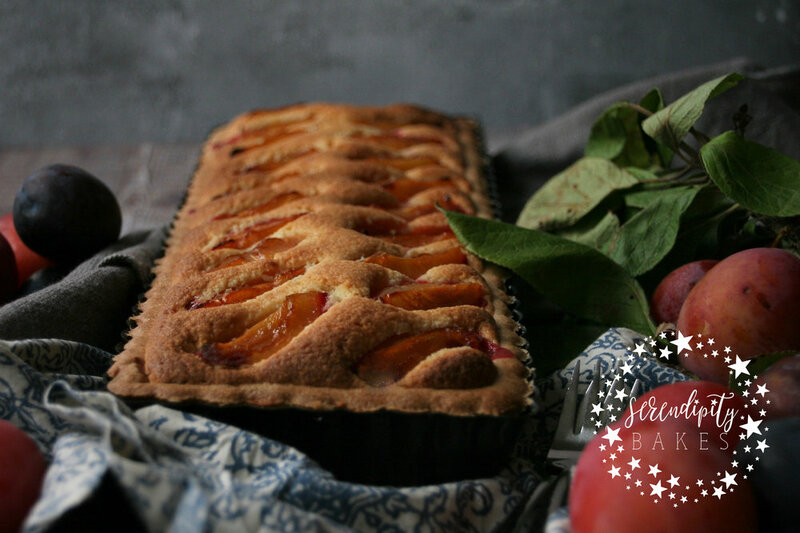 Stone fruit is so versatile and just as well as there's an abundance of it at this time of year and it all seems to come in at once! serve hot or cold, but best enjoyed with lashings of custard!